How awesome is that? lol Would love to hear some feedback comments below…. 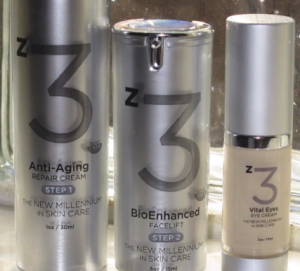 z3… Zoom back in time & look younger in 3 minutes! z3 BioEnhanced Facelift Duo is a 100% certified Toxic Free & organic 2 step facelift system that moisturizes, firms, tightens, lifts, reconstructs, repairs DNA and generates both collagen & elastin. It also eliminates wrinkles, bags, dark circles, acne and puffiness. It’s for men & women who want younger skin instantly. Results are dramatic and permanent. z3 is Essante’ ORGANICS patented, gold-metal award-winning Bio Tri-peptide, scientifically proven to repair DNA and generate more collagen & elastin than any other ingredient on earth. This intense formulation includes today’s most renowned, organic, anti-aging ingredients including: z3 Botanical Stem-Cells, White Tea Leaf Extract and Malachite mineral. It delivers such dramatic results, we dare you to only use it on half your face. 1. Apply Anti-Aging Repair Cream in upward strokes to face & neck. Wait 30 seconds. 2. Apply Vital Eyes Eye Cream & makeup (if desired). 3. Apply BioEnhanced Facelift gel, lift & hold above each area you desire major lift. 4. Do not rub or apply other products after BioEnhanced Facelift gel is set.